Nutrition for the last two and half years has played a big part in managing my disease. In this time, I have experimented with several nutritional strategies. These different strategies led me to start a ketogenic diet in October 2016. For those of you who have followed my journey you would know I have seen much improvement in my quality of life. Blood test markers including inflammation as well as my spirometry have all improved. For me, the ketogenic diet is now my lifestyle and not a diet. I thought it would be interesting to compare the ketogenic diet which I use, to the dietary guidelines(P61) recommended for COPD patients. The guidelines I have used are from Australia but are very similar from country to country. You can view my weekly updates on my dietary experiment via my COPD Athlete YouTube site. My dietary experiment lasted 4 weeks. During this time, I followed the dietary guidelines mentioned earlier. This way of eating was very different to the way I have been eating over the past two years, with a high amount of carbohydrates and sugar contained in the recommendations. The other difference was the five meals which were recommended I eat each day. On a ketogenic diet I would eat twice a day. Without a doubt the first difference I noticed with this new diet was the increase in my breathlessness. In fact, it changed so much in the first week I had my respiratory physician measure my FEV1 (lung function) and was astonished at the results. My lung function had dropped from 35% to 23%. Over the course of the four weeks my FEV1 stabilised between 23-26%, significantly different to 35% which was my norm when eating to a ketogenic diet. The next thing I noticed was the weight gain, 2 kilograms in the first week and a total of 4.1 kilograms over the four weeks of eating to the guidelines. What was scary about this was I had chosen the guideline for obese patients which I thought would result in weight loss. I hate to think what would have happened if I had chosen the guidelines for underweight patients. At the start of this experiment I was considered to be in a healthy weight range according to the guidelines own BMI (Body Mass Index). By the end of the four weeks I was considered in the obese range. Eating five meals a day was tough and I struggled with the constant feeling of fullness which over the four weeks made me feel more and more sluggish. I had a specific cycling route which I would complete each week. Each time I completed this course my time was slower than the previous week due to my increased breathlessness. By week three I had loss the desire to exercise. Not to mention I felt like I was constantly making food and eating. As you can see the dietary guidelines for COPD patients was not improving my quality of life, it was actually making it significantly worse. Loss of lung function, weight gain and motivation to exercise, all the things we strive for as patients, had disappeared. 2 weeks prior to starting my nutrition experiment I had full pulmonary function and exercise testing at my local respiratory clinic. The results were very encouraging with my pulmonary function tests my best ever. The respiratory scientist who carried out the test stated in the report that there was a significant improvement since my last test in 2015. The only difference in my COPD management strategy since 2015 has been the ketogenic diet. My FEV1 (lung function) at the start of this dietary experiment was 35% or 1.19L. My worst FEV1 result during the experiment was 19% or .68L recorded in my respiratory physician’s clinic seven days after I started. 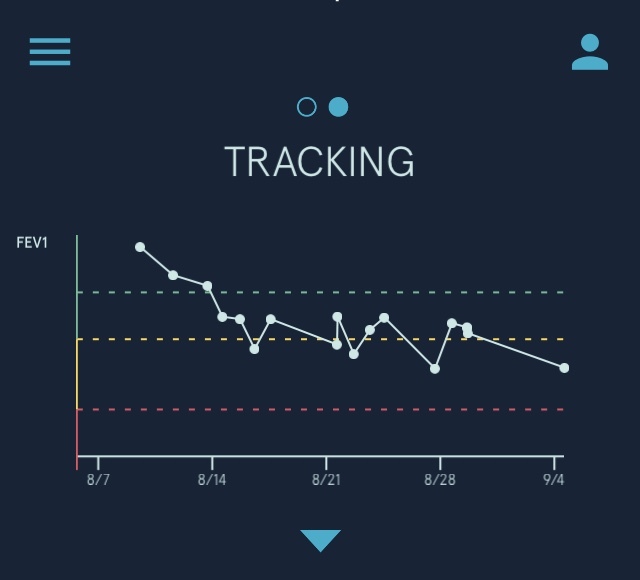 The graph below shows the decline of my FEV1 over the duration of the diet. The decline in my lung function matched how I felt, very breathless. In fact, it would be true to say I hadn’t felt this bad since I was first diagnosed with COPD. This alone would be enough for me to warn patients off looking to use his dietary guideline. It could be argued the 4.1 kilograms I gained in weight may attribute to my increase breathlessness. The problem with this theory is I ran the New York heavier than the weight I reached by the end of this experiment, and there is no way I could do that by eating this way. I must admit I was stunned my weight ballooned so much. I wasn’t eating Maca’s, KFC or Burger King, I was eating healthy nutritious foods, apparently. Along with the weight gain I saw a rise in my cholesterol levels from 5.2 to 5.9H. Blood glucose control for COPD patients is important for a number of reasons, including the prevalence of diabetes within the COPD community. Higher levels of blood glucose are associated with inflammation. Systemic inflammation is something which respiratory patients need to keep suppressed as it drives the progression of our disease. Over the course of this dietary experiment I saw a continual rise in my blood glucose levels as the graph below indicates. If this pattern continued it may well lead to type 2 diabetes along with other health issues associated with high blood glucose levels. In the interest of fairness, I have to admit I was expecting a rise in my C-reactive protein (CPR), a marker of inflammation. My blood results taken on the last day of this dietary experiment showed no movement in my CRP result. Whether my CRP would have moved if I continued with this diet we’ll never know. My thought is, it absolutely would have. The symptoms I had and my previously high CRP levels ,back when diet wasn’t a big thing to me, would indicate to me as time went on CRP would go up. Neutrophilic inflammation is a prominent feature of COPD. Over the course of this diet my neutrophils increased from 3.51 to 4.43, whether this is significant or relevant, I’m not sure – minds greater than mine may be better equipped to comment on this. Since finishing this dietary experiment almost four weeks ago my health has returned. I went back to a ketogenic diet where I have seen my lung function return to normal and my weight decrease 3 kilograms. I’m back exercising regularly and am feeling motivated again. Nutrition is a very personalised topic, what works for one person may not work for another. Finding a diet which works for you is crucial in your overall management of your disease. While I have found the ketogenic diet is the nutritional strategy which works for me, I will always be open minded to better strategies. The most obvious lesson to come out of this experiment for me, is eating carbohydrates in the form of pasta, bread, rice and potatoes are a recipe for disaster. They cause me to become very breathless and this is also the experience of other patients I’ve talked to. If you’re reading this thinking I don’t become anymore breathless eating these foods, chances are, you probably haven’t cut them out of your diet and then reintroduce them. This would be a way of working out if they cause you problems. I am pleased that the word is getting out there regarding how the Ketogenic way of eating reduces inflammation and improves lung function . Thank you Russell for all your contributions to proving the benifits of this way of eating! I have been eating the ketogenic diet since May of this year and have marked improvements in my health: improved lung function, improved energy, improved brain clarity, reduced inflammation. I am working with my Pulmonary Dr. and have reduced my inhaler dosage and will be tested soon to see I can be taken off CPAP. I am a firm believer that the Ketogenic diet is the way of the future for so many who struggle with COPD. Great to hear Georgene. I may have to get you on my podcast…. I was just diagnosed with COPD today, so I am reeling a bit (understatement). I was also diagnosed with severe sleep apnea – the test showing I quit breathing over 50 times per hour. Help. I was doing the ketogenic diet for awhile. It seemed to me that the apnea symptoms decreased dramatically and when I told my pulmonologist, he said it was probably due to a decreased acid reflux. Well – I never had symptoms of acid reflux. I am also not a heavy/obese person, weighing in at 145 & I am 5’7″. I DID lose about 5 pounds on the keto diet. A couple of months ago I had a DNA nutritional test done which showed I should be on a balanced diet, rather than a high fat diet so I modified the keto diet greatly. I am just not sure what to do. My question is – with the keto diet, I felt very restricted from eating many of the “good vegetables” which are recommended for COPD patients such as sweet potatoes, squash, etc. Do you modify your keto diet to include these vegetables. Any recommendations you can give me will be greatly appreciated. Also, do you have to use supplemental oxygen. My pulmonologist says I had “moderate COPD” and wants me to use oxygen during the day. I only hope he knows what he is doing. What an encouragement you are – I look forward to reading everything on you site, and I hope to hear from you. Thank you. Hi Vicki, I don’t eat any starchy vegetables as they worsen my symptoms. My diet is approximately 70% fat, 20% protein and 10% carbohydrates. Sounds like you need to do some fine tuning. I would find a dietician experienced in ketogenic diets, this link is a good resource and has contact details for dieticians experienced in keto.